This is Part 3 of our series, Setting up a blog. Missed a post? Check out Part 1 or Part 2. 2 things bug me as a geek. 1) People with their own domain name, but advertise a gmail or ISP address as their email address. It looks cheap and unprofessional. 2) Not having everything in sync. I like to be able to pick up my email whether I’m at my laptop, on my phone or out at another computer. Well luckily there is a way for me to have my cake and eat it too. To be able to have a customized email address (me@mydomain.com), and to have my mail in sync across all my devices, and still have a “cool” webmail client (the same as gmail). Google has the answer, and it’s called Google Apps. Google apps allows you to use the feature packed web based applications that Google uses in Gmail, with your own domain name. So you get all the features of a Gmail account (gmail webmail, google calendar, google Docs, and access to the other 65+ services Google offers) with using your own domain name. The only downside to Google Apps is the setup that’s involved. But they have made it really easy to do, and our friends at VentraIP and getanamecheap have made it even easier. A side note before getting started: Google changed their terms of service for this product back in May of 2011, prior to then, you were able to associate 50 users to your account for free. They have reduced this limit down to 10. If you want to have more, you have to upgrade to the business edition which is approx $5 per user, per month. 1) Go to the sign up page for Google Apps and click on the button “Get Started” in the right sidebar. 3) Fill in the rest of your details. A few hints: use whatever you want your email address to be as your username. So if your name is mary and want to have mary@maryscollections.com use mary (sorry if someone is using that email address). You’ll also need another email address in case you forget your password. 5) If everything went well, you’ll be asked “How would you like to set up Google Apps?” – Click on Express. 6) Follow the guide here. (it’s a lot of pushing next you can leave at any time, it’s just the first step that is important). If this is your first time setting up Google Apps, then you should work your way through it so you can gain a better understanding of how it works. 7) The first step is “Verify Domain Ownership”. Click on next until you see the screen “Recommended: Add a DNS record to your domain’s configuration.” In the drop down box scroll to the bottom of the list till you find “Other”. Copy this ugly piece of text. Next to your domain name there’ll be a drop down with “– Options –“. Select “Google Apps DNS”. At the bottom of the screen there is box to paste in your “TXT Record Validation” code. Paste that ugly piece of text into there and press “Add Google DNS Records”. Click on the domain you wish to edit. Click on “All Host Records” in the left hand menu. Then Under mail settings, select “user” then “Automatically set MX records necessary for Google Apps Email ” And press save to save all the changes. Wait 5 minutes. Now go back to Google Apps and press Verify. That’s it, you’re done! There are some more options that you may wish to set. Geek Tip: Setup a Custom Webmail URL. It’s easier to remember: http://mail.yourdomain.com.au to be able to check your email than http://mail.google.com/a/yourdomain.com.au so Google allows us to change the domain to the easier to remember one. It just takes 4 easy steps. Click on Settings in the Google Apps Administration main menu bar (the top blue one), then click on email in the left hand menu. Under “Web Address” click “Change URL”. Select http://mail.yourdomain.com.au (Leave it as mail) and click continue. Then on the next page “I’ve completed these steps”. Your done. (but hang on, I didn’t do anything. When you changed your DNS settings before, you automatically set up the other cname web address for you in advance). This is a follow on from Setting up a blog – Part 1. If you haven’t read that you may wish to go back and have a look. If you have used a different web host, which supports cPanel, then these instructions will still help you. Welcome back. After our short break, hopefully the internet had enough time to catch up. It goes through a process known as propagation, where all the phone books used to make the internet work get told that there is a new address and new house in town and here is how to get there. (although it’s a lot geekier than that). Following on from part 1, you should now have a brought a domain name and some web hosting and are ready to setup WordPress. After signing up you will have received an email with your hosting information. 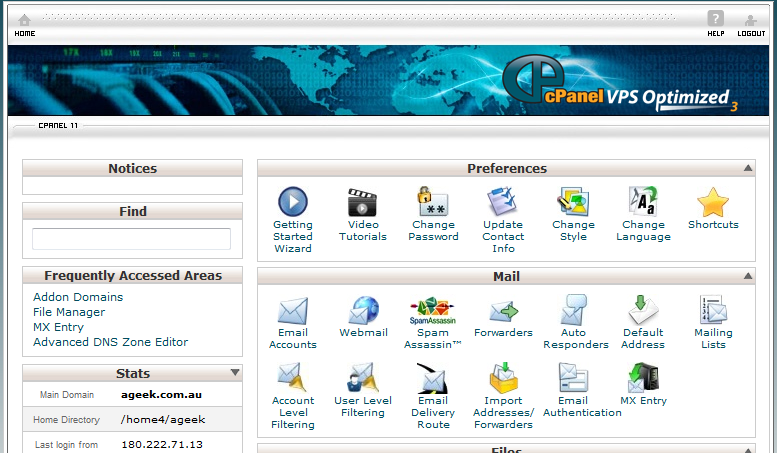 It will have a section about accessing your cPanel control panel, with a URL, an IP address and a username and password. The URL is usually something like yourdomain.com/cpanel.Go to that URL and login with the details that where provided in the email. If it’s not selected, select the Applications Browser Tab. Scroll down and look for the Application called “WordPress” and Click on it’s icon. Path: make blank. (you could put it somewhere else if you like). Change the Administrator password to something that suits you. Change the website title to the title of your site. Leave enable multisite as “no”. Wait 30 seconds for it to install. You’re done. Now you test your blog at: http://yourdomain.com and you can login to the control panel at http://yourdomain.com/wp-admin and start using your new blog. HELP! It’s not working! – Troubleshooting Tips. Going to http://yourdomain.com doesn’t work at all. The process of DNS propagation can take up to 48 hours to fully complete. Try again soon. If it still doesn’t work after 48 contact the company that you registered the domain through. You have now successfully invested in your own little piece of the internet. In the next article we’ll go through how to tweak your WordPress install to get the most out of it. What does the number 1 blog in 2008, as well as the number 1 blog in 2009 and 2010 as voted by the Webby Awards have in common? They both use the same system to power them. This system is known as wordpress. No matter what your message is, whether it be for fun and entertainment, a hobby, or a business, when starting your blog you want to get off on the right foot. Many people start with just a free blog solution to see how things stick, then when their blog starts to take traction and they out grow the features provided by their free blog they get stuck. Don’t let this happen to you. Start off on the right foot. It’s easy. No longer do you need to be a certified geek like you once did. So start off with brainstorming things to write about – this is best done with a large piece of paper, and friends if possible. Once you have your ideas its time to turn it into a domain name. What the, is a domain name you ask? It’s like google.com or ageek.com.au. You buy the rights to use it for a period of time (usually 1 or 2 years) and then at the end of that time you can renew it. Just like a car rego. 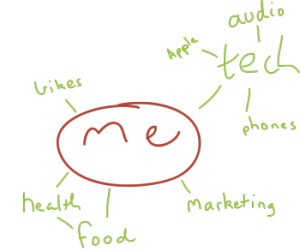 Brainstorm around 5 or more possible domain name ideas (again this can include yourname.com if you like). There are a few guidelines here. Try and keep it as short as possible, areallycoolblogaboutamazingawesomethings.com is just too long. Coolblog.com would be much better. But unfortunately someone has taken it. So maybe acoolblog.com anyway you get the picture, come up with a list of 5-10 ideas. Letsgoshopping.com – Buying a domain name. No matter which site you use, they both have a large search box “start your domain search here” or “instant domain registration”. Type in your number one choice for a domain name, and select .com and see if it’s available, if it is, great add it to your cart. If not, don’t worry just work your way through your list until you have one that is. Once you do, add it to your cart. Don’t check out yet, we need some real estate. Web Hosting – Your house on the internet. In order to put your website on the internet, you need somewhere for it to “live”. If you think about a domain name representing a street address, then the webhosting is the house that resides at that address. The easiest way to get your own hosting is to buy some web hosting from a company like getanamecheap.com or VentraIP as they have the geeks to set up and maintain the servers, and then all you have to worry about is your writing. If you’re using VentraIP add either The Economy or the EconomyPlus plan to your cart. (The plans are pretty much the same, the EconomyPlus plan gives you 20GB on online storage for your site – most WordPress sites use 200mb, which is 1% of what VentraIP give you, but you can also add as many domain names to your account as you want, where as the Economy plan only allows for 10). Geek Tip: Save money buy prepaying 2-3 years of hosting in advance. When you look at your shopping cart, you should have 1 domain name and 1 hosting package. When you added your hosting package to your account, you should have been given the option to link it to your domain name in your account. You want to do that, if you didn’t it just means that there is an extra step down the track. Before pressing the final button to checkout, have a quick google to see if there are any coupon codes that will save you money. HNY12 gives you a discount on new .com/.net domain names. 2012ROX gives you 10% of your first month of hosting. VIP50 gives you 50% of your first invoice of web hosting. Once you have entered any coupon codes, made some savings, go ahead and check out with your credit card or paypal account. The total investment should be under $100. (Extra Geek Tip, if you want to kick start your blog a little, go to GoDaddy Auctions and search the expired domain names for something like what you want – unfortunately the scope of using this service is slightly out of this blog post, so you’ll have to be brave and work it out on your own). Masterchef is a huge hit, then why not Mastergeek? Calling all (Geeky & non Geeky) Android Users. – Free 50GB of online Storage. Telstra’s great outage. – What [didn’t] really happen.